The human race further evolves with the “development“ of intelligence into the next century. The Department of Computer Science combines advanced knowledge and techniques from a wide range of fields including mathematics, science, engineering, information technology, computer science, artificial intelligence, artificial life, software engineering and system control engineering. The Department offers degrees in four areas: Networking, Mathematics and Mathematical Science, Computational Intelligence, Computing and Communications, and Multimedia and Human Computer Interaction (HCI) and allows students to follow their own interests within a flexible framework. While learning, students also get opportunities to get involved in state of the art research. The department also works closely with industry requirements to develop resources that can contribute to all of society. I was nervous before I joined the university because I assumed that there would be very few girls at the School of Engineering. But actually, I soon made many friends, both boys and girls and was able to lead a very exciting and fun university life. I loved playing games from when I was small. Soon, I started to become interested in gaming graphics, music, systems….and decided to enroll in the school of computer science and engineering. In class, we learned about computing structures and programing. At first, I entered the lab with no knowledge of C language and I struggled to complete even one exercise. Now, I can somewhat utilize the knowledge I have gained. There is also a class called scientific and technical English. They teach you a lot of engineering related words so if I have to write a research paper or do a presentation in the future, this class would definitely be useful. There are definitely benefits being a student at a technical university…I hope you too can achieve your dreams here! It’s already been 3 years since I first set foot onto Nagoya Institute of Technology campus and now I am in my 4th year, enjoying every single day. At the Department of Computer Science, we have the opportunity to gain a broad understanding of the structure of a computer, from hardware point of view like the CPU and from software point of view like artificial intelligence or computer graphics. Without realizing, these computers support and make our daily lives comfortable in many ways. The learning environment is well facilitated and we are very fortunate to have the department laboratories, where Computer Science majors can use the computers, anytime of the day, at our disposal. Outside the classrooms, the University has helped me form a strong relationship with my peers and professors and has greatly helped me mature as a person as well. I am convinced that the strength, knowledge, and experience you will gain from enrolling into the Department of Computer Science will be irreplaceable. I say this because this is true for me. So for all of you out there, considering a university, whether you are interested in computers or not, join me at the Nagoya Institute of Technology’s Department of Computer Science and see for yourself the fascinating world of computing and manufacturing, and enjoy the social life as a university student! I am no poet but I hope that my words were able to give you a glimpse of the wonderful opportunities you could experience today! At the Department of Computer Science and Engineering, you can learn about the basics of computer science to the technical details, in a structured manner. As you move on every year through the course, you start to understand how they all come together and relate with each other and become even more interesting. You also get to reconfirm what you have learned, through laboratory exercises. The laboratory exercises are usually done in groups and you’re hardly on your own so not only are the exercises fun, but it ensures that we understand and if not, we can help each other out. We all work and stimulate each other and make sure we always think “out of the box”. Computer Science technology is invaluable in various fields. If you can keep an open mind, you will one day, see the path that you must take. I hope you can find what you want to do through the Department of Computer Science and make it a reality. Computers are used in games, in cars and in other various aspects of our lives. I applied to the school thinking that it would be interesting if I could deepen my knowledge and be able to control them. In class, we learn the basic program that controls computers, all the way to manipulating CG, robots and sounds too. Using this knowledge as the base and applying it in various different ways, I have been able to create a simple application of my own. Since I have been appointed to a research laboratory, I have been learning about VR, which has been an area of interest of mine. I would like to further continue my research and deepen my knowledge and techniques. Take a moment to consider the wonderful opportunities that a graduate program can bring for you. Open Lecture “Computer Science Adventure – Theoretical Computer Science is just so exciting!” will be held. Prof. Takayuki Ito will visit Hujishima high school for a visiting lecture. 3rd Open Day will be held. See “University Open Day” for more details. Prof. Toramatsu Shintani will visit Aichi Prefectural Toyotakita high school for a visiting lecture. Prof. Takayuki Ito will visit Aichi Prefectural Anjohigashi high school for a visiting lecture. Assoc. prof. Tadatika Ohzono will visit Ichinomiyakodo high school for a visiting lecture. Open Lecture “Viewing the world through IT Technology! Change the world!” will be held. Open Lecture , “’See, Hear and Talk’ – The cutting edge technology for sensory media” will be held. 2nd Open Day will be held. Department of Computer Science held a taster lecture on “Distributed Computing supports Big Data Era”. See “University Open Day” for more details. 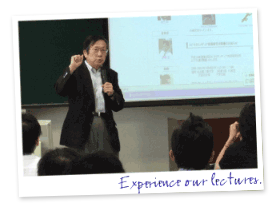 Prof. Yoshiaki Katayama visited Tajiminishi high school for a visiting lecture. 1st Open Day will be held. Open Lecture Computer Science Adventure – Theoretical Computer Science is just so exciting! 3rd Open Day was held. See “University Open Day” for more details. Open Lecture Experience Programing ~Let’s create a program to control a robot ~ was held. Open Lecture “Viewing the world through IT Technology! Change the world!” was held. 1st Open Day was held. 3rd Open Day was held. Festival for Women in Technology was held. 2nd Open Campus was held. 1st Open Campus was held. As you can see, there are various opportunities available for the future and can also sense the high expectation from society, towards the department’s education and research. Also, the option of moving on to graduate program is available and over 70% of our graduates continue their studies to pursue a Master’s Degree. Many then, also continue on to doctorate degree and once completed, they utilize their knowledge in university and corporate laboratories. In 2017, our University received about 400 job offers for both our undergraduates and graduates students. We utilize school recommendations and alumni networks to ensure that our graduates secure a wide range of posts with many being with major global and promising companies. Many students choose to further study; over 70% of our students continue to study and gain their masters or doctorate degree. We nurture resources that will create the future of our information society. As all of you are aware, new systems that are transforming social structures such as SNS are continuously created through the information field. In today’s heavily informed society, such technology and systems created by computer science have become the main support underpinning the stability in our society’s transformation. We have been able to realize complex functions with artificial intelligence, which living beings were thought to only have, such as intelligence, senses, feelings and emotions, through computer science. We are also researching the structure of how to artificially recreate social activity traits, such as the ability to work together, negotiate and build a consensus, in hopes to support various people and our society. My wish is for all you young people to experience, first hand, the appealing characteristics of computer science and the power it has to directly affect society’s innovative changes.